I will begin by emphasizing the distinction between the symptom and other formations of the unconscious. Let’s pinpoint the register of the signifying intention, of the “wanting-to-say” (le vouloir-dire). We can’t define a slip without reference to a different, prior “wanting-to-say.” When we speak of a slip, we refer to the interference of another “wanting-to-say,” as if another had spoken, and the supposed intention of which made the first fail. A joke is the triumph of the “wanting-to-say” to the extent that, according to Freud, it’s finally the other that appropriates it and gains a bonus of pleasure greater than that of the sender himself. The mistake is the equivalent of a slip in action. It supposes an intention that is traversed by another that makes it run aground. But the symptom, as such, doesn’t seem to be related to a wanting-to-say. Before Freud, no one asked about the wanting-to-say of the symptom. Or rather, no one posed the question scientifically. For us, the wanting-to-say in the three formations of the unconscious is different from that of the symptom. The emergence of the “wanting-to-say” from the symptom is a lot more complex, often slower, and a lot more doubtful. It doesn’t happen just one way for everyone, or for every symptom. On this point, I’ll mention a reference of Lacan’s that is often mentioned, but that hasn’t, I believe, been given its due. Lacan says that the symptom is a phenomenon of belief, constituted by the fact that one believes in it: one believes it, one believes in it, as one believes in an entity that could say something. I will come back to the term “belief,” for one could think that the symptom imposes itself such that it wouldn’t be a matter of belief. I think that the belief that Lacan talks about is like a belief in the “wanting-to-say” of the symptom. Let’s approach a second trait, one which doesn’t seem to me to be debatable phenomenologically: the temporal difference. The slip, the joke, the mistake, all obey a temporality of the moment (instant), the sudden flash of which Lacan took pleasure in exploring. This is what characterizes the formations of the unconscious. The slip, the joke, the mistake are all things of the moment. Nothing kills a joke like asking the person who made it to repeat it. Duration and permanence, on the other hand, are essential to the symptom as psychoanalysis distinguishes it. Could a slip transform itself into a symptom? If someone makes a slip systematically, we will, in the end, consider it a symptom. Similarly, if a mistake is repeated, we may decide, perhaps, that it belongs to the register of the symptom. And jokes? Perhaps for the witty person who can’t stop making people laugh, we’d resolve ourselves to classify this way of acting on the side of the symptom. This indicates that the essence of the symptom is repetition, which opposes itself to the flash of the other three formations. Since we’re in the clinic, it is necessary for us to give exceptions their place. The single appearance of an elementary phenomenon could be enough for us to take it as a psychotic symptom. But this depends upon its possible repetition. When we say symptom, repetition is always found on the horizon. Now we can understand what Lacan called the “et cetera” of the symptom. A symptom is destined to repeat itself, it takes all its clinical significance from this contrast with the flash and surprise of the three other formations. Lacan talked about surprise as a structural trait of the unconscious. The symptom as “et cetera” is the opposite of surprise. When we say, “That’s him all right” or “That’s just like her,” that’s the “et cetera” of someone. A person’s symptom is his or her true identity. Lacan said that the symptom of certain persons could be the most real thing they possess. This illuminates for us how the symptom is associated with the real. The hypothesis of the symptom as real is to be understood in opposition to the symptom not as symbolic or imaginary, but as real, and precisely by reason of its repetition, as repetition. In his doctrine of the logical modalities, Lacan placed the symptom very precisely at the level of the necessary: the symptom doesn’t stop writing itself. It seems that in advancing step by step, I have succeeded in tying together several points that we’re all familiar with, but I have also separated others for want of any clear and logical reason to inscribe them in the same perspective. We’re going to proceed by a short-circuit. Half the fun of taking things step by step is to go back afterwards and check by means of a short circuit to see if everything holds together. Before recognizing in the symptom a wanting-to-say, we could consider it, at the very least, as an articulation of signifiers, possibly without any meaning. That is, as knowledge, a knowledge that doesn’t stop being written. That’s the short circuit: it could be that the symptom, thus defined, is for the analyst knowledge in the real. To refer to a knowledge in the real is the privilege of science. Thus at the level of the symptom, we could have in psychoanalysis the equivalent of what is proper to science. Does this mean that with the symptom, psychoanalysis becomes able to compete with science? In this short circuit, some will recognize the echo of a vast problematic of Lacan’s that appears in various places and with different answers. Let’s try it Freud’s way for a moment. In Freud, the symptom is found to be essentially attached to Wiederholungszwang, to the repetition compulsion. I refer you to chapter ten of Inhibitions, Symptoms and Anxiety, where Freud points out that the symptom implies a fixation and that the fixating factor resides in der Wiederholungs­zwang des unbewussten Es, in the unconscious id’s compulsion to repeat. Attached to the symptom, as the essence (âme) of the symptom, the constancy of the drive, what Freud calls the demand of the drive, Triebesanspruch, already anticipates in a certain way the Lacanian conceptualization of the drive in the modality of demand. This allows us finally to understand why Lacan was so preoccupied with thinking about the symptom, science, and knowledge in the real. 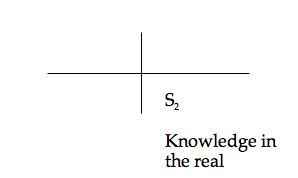 The question is, in what sense is the symptom knowledge in the real? The idea of the symptom as knowledge in the real makes us understand why Lacan raised the problematic of belief in the symptom. Lacan never wrote a paper on belief in the symptom, but he once developed this theme on a specific occasion. Why? Because belief is the opposite of knowledge, at least according to the logician Hintikka in the very title of his work, Belief and Knowledge. The symptom isn’t exactly knowledge in the real because it implies an element of belief. But the problematic of belief in the symptom can’t be understood without being linked to that of knowledge in the real. Lets move on to another question: towards what does belief in the symptom tend? This belief depends on the fact that the symptom possesses a meaning to be deciphered, it is belief in the symptom insofar as it is an entity that could speak, an entity animated by a wanting-to-say. Questioning the status of the symptom in the real leads to another question: is it possible that there could be meaning in the real? This is a recurring question in the last teaching of Lacan. It concerns the Sinn und Bedeutung of the symptom, which imposes itself along the way from Lecture 17 to Lecture 23 [of Freud’s Introductory Lectures]. Is it really possible for the symptom to consolidate the reference to the real, Bedeutung, and the semantic value of the Sinn? This question concerns the logical or conceptual possibility of thinking of a meaning in the real. And it’s all the more pointed insofar as the very notion of the real excludes meaning. This is what the Borromean era of Lacan’s teaching turns upon: the exclusion of the real and of meaning. For it even to be thinkable that there be knowledge in the real, God is necessary, but for it to be thinkable that there be meaning, God is even more necessary. For us to have knowledge in the real, the God of the philosophers, however secularized, is necessary; for us to have meaning in the real, it’s the God of Abraham, Isaac, and Jacob who is necessary. A challenge to science is one possible path. By questioning the possibility of meaning in the real in the Borromean part of his teaching, Lacan questioned the very foundation of psychoanalysis, but also the foundation of science. The conclusion isn’t that science is worthless (que la science ne vaut rien), but that it implies an “utter worthlessness” (comporte "une futilité totale"). This seems excessive when one considers the references that Lacan makes to science. Nonetheless, science is worthless insofar as it is impossible to maintain that there is a knowledge in the real except on the basis of a subject supposed to know. Meaning in the real is possible in the clinic under transference, but that’s a kind of mirage. How do we think the unthinkable of meaning-in-the-real? I see several solutions to this impasse. First solution. If the symptom resides in the presence of a meaning in the real, then it must be that the effect of meaning produced by the interpretation arises also in the real. Lacan, at one time, imagines such an effect of real meaning. The second option consists in considering psychoanalysis to be a scam. Lacan took himself to Brussels to announce this to the Belgians. It was a single lecture of Lacan’s that was reported on immediately in the Nouvel Observateur of the following week: “Jacques Lacan Says that Psychoanalysis is a Scam.” It’s a scam insofar as meaning and the real are disjointed, but the analytic operation supposes that meaning has an effect on the real. Third option. If we don’t turn to an effect of meaning or to psychoanalysis as a scam, it is possible to speak of something more reasonable: that psychoanalysis has nothing to do with the symptom as such, but with the statements (dits) of the patient that refer back to the symptom as their reference, Bedeutung. As Lacan explains, we can’t take these statements literally. The analyst has to do only with the Sinn of the symptom in such away that the symptom depends on the register of truth, of variable truth (vérité variable). Joan Salinas presented at Barcelona this part of the Borromean teaching of Lacan, which situates the symptom as variable truth, and not as real. 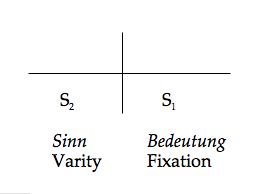 Lacan speaks of the varity of the sinthome (varité du sinthome), where “varity” condenses verity and variety. From this we could try to produce a verification, a verification internal to our scholastic. I write the four places of the Lacanian schema of discourse. We translate the reference of the scientific discourse to a knowledge in the real by putting S2 in the lower right position. I consider this to be the place of the real, taking my lead from the quasi-identity of the hysteric discourse and the scientific discourse. Fourth solution. It is possible that meaning and the real could be completely disjointed. Lacan is very eloquent when he separates meaning and the real. Paco Pereña speaks of a certain patheme in saying that as analysts we are perhaps not in the main current of modernity. Concerning the division between meaning and the real, I can assure him that the idea that meaning has nothing to do with the real has been the alternative that has guided American philosophy since World War II, since Quine was emancipated from his master Carnap. 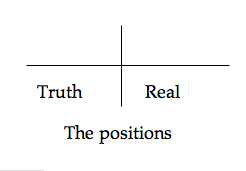 The fourth possibility is the disjunction of meaning and the real. But also the disjunction of knowledge, of any knowledge worthy of the name, and meaning: the operational mathematical formulas of physics constitute a knowledge different from meaning. To summarize, meaning has nothing to do with the real, meaning has nothing to do with knowledge, and outside of science knowledge has several difficulties with the real. But the fact that they have nothing to do with each other two by two doesn’t prevent them from maintaining a solidarity. That’s the beginning of the Borromean solution of Lacan. If we take them two by two, as in logico-positivism and the neo-logico-positivism of Quine, it doesn’t work: language never gets anywhere. But if we take the three together, knowledge, meaning, and the real, perhaps everything will work out all right. There is a fifth solution, a variation of the preceding oneif it doesn’t work with three, perhaps it will with four, with the symptom as the fourth. Lacan didn’t choose. He gave us several solutions to a single aporetic problematic.